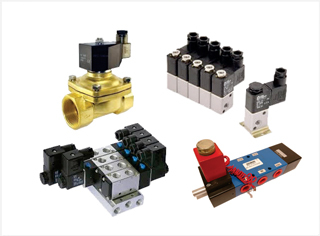 Various Solenoid & Manually Operated Valves are available with variety of designs & dimensions to suit application requirements. These valves are in puppet as well as spool design. Puppet design is recommended where flow requirement is more & air quality is not consistent. These valves can be fitted on gang Manifold with common inlet, where no. of connections & space can be saved. These manifolds are available for required no. of valves. We specialize in custom build valves, where standard designs are modified to suit customer requirements. We have manufactured import substitute special valves for no. of Textile Mills.